It’s never wise to react to an NFL contract until the structural details are released, particularly with the 49ers. President of 49ers enterprises Paraag Marathe has specialized in incentivizing and front-loading contracts to protect the team. If a player doesn’t perform or stay healthy, he will likely not maximize his earning potential. That’s the case for Dee Ford, the team’s marquee signing of the 2019 offseason. Last week, the 49ers signed Ford to a reported five-year, $87.5 million deal, obviously massive money. It wasn’t until this weekend, however, that the specific details were released. And Marathe has come through again with another team-friendly deal. Remaining $25.25M guarantee is for injury only, with $13.65M “rolling” to full guarantee April 1, 2020. The 49ers can opt out of the final four years of Ford’s contract if he doesn’t perform this upcoming season. While the Pro Bowl edge rusher has certainly played well recently (he led the league with seven forced fumbles and 78 pressures in 2018), he has endured injury issues throughout his first five NFL seasons. If that continues, the 49ers have the option to let him go after the 2019 season. This is a positive revelation for 49ers fans who hadn’t seen the details of the contract. 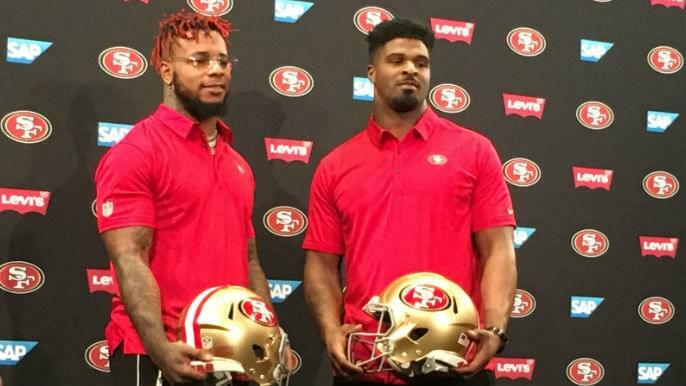 The next-most expensive 49ers deal of the offseason was Kwon Alexander’s, but that, too, may not end as lucrative as the initial numbers suggested. Alexander reportedly signed for four years, $54 million. At the time, his $13.5 million in annual salary was the most ever for an inside linebacker. But Marathe front-loaded the deal, again. Alexander will earn $14.25 million in full guarantees. He will make $10.25 million in his first year with a cap hit of more than $11.5 million. The 49ers can choose to let Alexander go after Year 1, like Ford, should he underperform. They would owe him just $3 million if that is the case. If he stays for the entirety of his deal, his base salary will be $11.25 million in 2020, $12.55 million in 2021, and $12.65 million in 2022. Marathe has earned his reputation as a savvy contract specialist. Last year, he filled Richard Sherman’s contract with incentives, which only come into effect if, for example, he plays 90 percent of snaps or makes a Pro Bowl or All-Pro team. Marathe also stacked all the guarantees in Jerick McKinnon’s four-year deal in the first year. These details protect the team and reward the player if he plays well, which is the way it should be.